So the road race was today and it marked the end of the Velotek Grand Prix, but it certainly ended with a bang, no doubt. 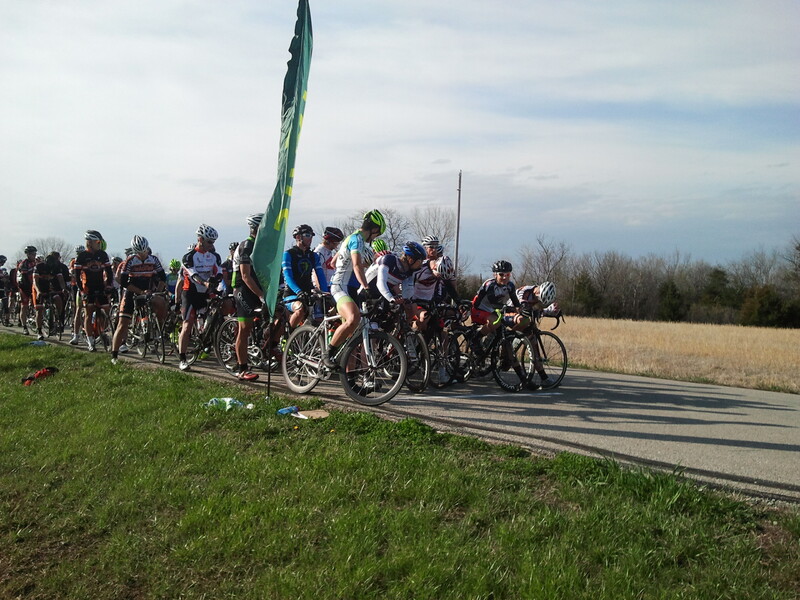 The course was full of Kansas’s biggest hills which make for a more interesting ride. This being one of the first full cat 2 and 3 race series that I had done I didn’t really know what to expect for the road race. So me being me, I tried to get in every breakaway that went and sure enough that’s what I did. After the first lap I was feeling very good, but the pack was being very rambunctious. It was surge after surge, attack after attack, and oddly nothing got away not even a group of ten that should have ended it once and for all. Once the first lap was done we got to the first hill where someone attacked, at this point I was boxed in sitting in the second row and no one even flinched. Then a rider from Gateway Harley went after him and still no one even moved. So because it was obvious pack did not want to chase, I decided to go after it. At this time the guy between the leader and me was about 30 seconds and growing so the second I saw an opening I grabbed a gear and nailed it. Sure enough when I looked back I had torn a big enough gap that no one was going to sprint up to my wheel and sit on it. Knowing this I amped the speed up to about 30 mph and held it. Then the gap between me and the breakaway had shrunk to about ten seconds but we were fast approaching a downhill section of the course and I knew I was going to be in trouble due to my junior gears if I didn’t get to the group fast. Unfortunately, I didn’t get to the group in time, I was too late. So on the downhill the pack caught me and I moved back to the second row. The funny thing was that the break I had just missed would be the one that would stay away for the rest of the race. BUMMER! After several attempts to go with a second break, about ten kilometers out my legs were shot. So I decided I would just sit in for the end and finished with the main group and there you have it folks, that’s all she wrote. I love hearing your strategy, it makes me feel like I was there!